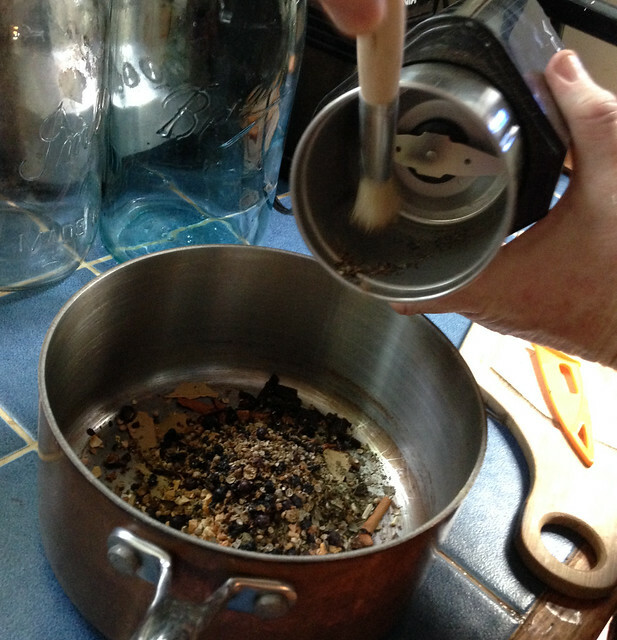 Today, we welcome Renee Johnson, as our guest blogger, telling us all about her adventures in learning how to make vermouth. 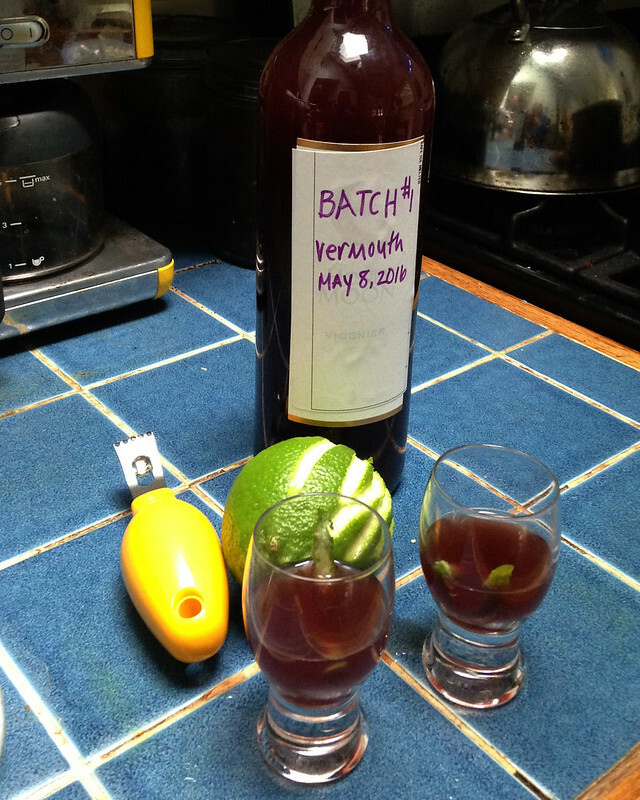 My husband, Jeff, and I decided to make vermouth after attending an event at the U.S. Botanical Garden in April. The event, “The Herbal Apéritif: A Tasting Journey of Vermouth,” was hosted by vermouth makers Dwight Grimm and Leigh van Swall, who own Little Alchemist Herb Farm and Distillery in the Catkills, New York. Many notable vermouths are made in France, Italy, Spain, and the United Kingdom where the tradition of flavoring wine with herbs and fruit evolved into the making of vermouths and apéritif wines (also called aromatized or fortified wines). Apparently, in the 1940s, there were 225 vermouth-makers in the United States, and martinis were made with more vermouth (and less spirits) than they are today. I highly recommend following Renato Vicario, the author of Italian Liqueurs, History and Art of a Creation. Making vermouth at home is easy using cheap wine and a spirit, such as brandy, for further fortification, and of course a wide range of herbs to taste. Grimm and van Swall use between 15-20 herbs in their vermouth, but some vermouth makers use as many as 80 herbs in their vermouth. Most vermouths are made with white wine and slightly fortified with brandy, vodka, or eau-de-vie (“water of life”), bringing the alcohol content to about 14-16 percent. Even red vermouth is made with white wine, but might be sweetened or colored with caramelized sugar water to make a sweeter vermouth. 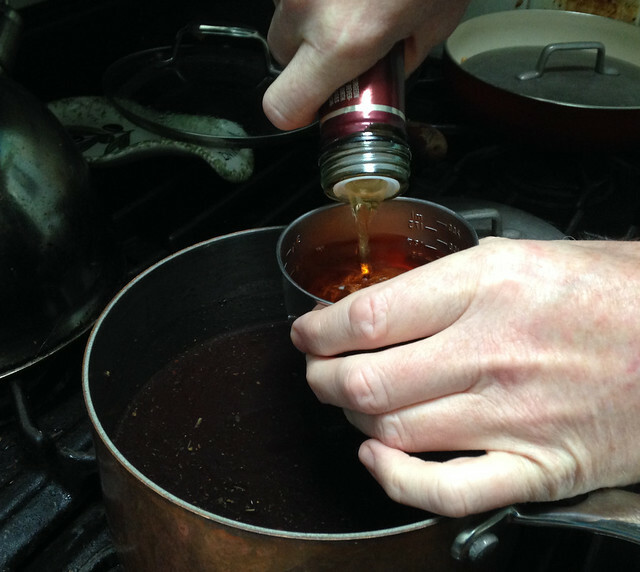 We made a dry vermouth and did not add caramel to our batch. Two of the more common vermouth herbs are wormwood (infamous as an ingredient in the spirit, absinthe) and cinchona root. Gentian root also provides some of the characteristic vermouth flavor. 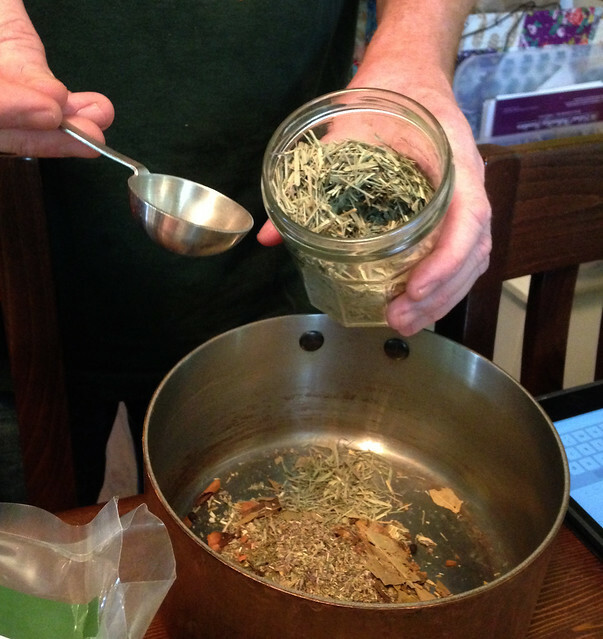 These three ingredients were the main herbs we used. The recipe we follow and a few sources to buy the herbs is at the end of the post. 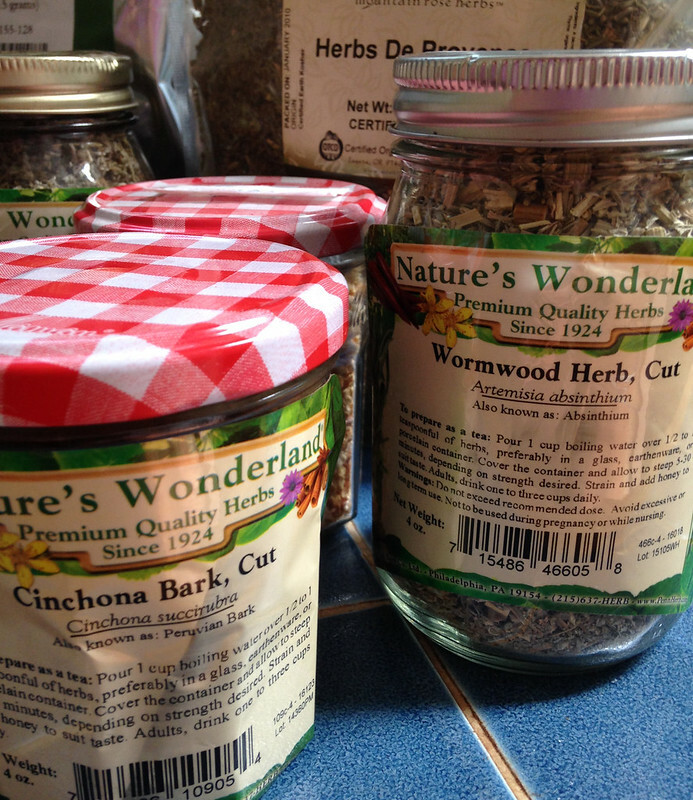 I admit that after working on our second batch, it seems we’ve been using too much (and are maybe still using too much) of the core herbs: wormwood, Chinchona bark, and Gentian root. In addition to wormwood, cinchona and gentian root, other herbs we included were: bay leaf, sage, savory (Summer), lemongrass, Herbs de Provence, dry orange peel, dry lemon peel, black walnut leaf, coriander seed, juniper berries, vanilla bean pod, cinnamon stick, elder flower, elder berries, and star anise – a total of about 18 herbs. 1. We added a single bottle of Trader Joe’s “2-Buck Chuck” (we used Chardonnay) to the herb mix and put on the stove at a low heat so as to not boil off the alcohol. Once it came to a low boil, we took it off the burner and let it cool. We then let the mixture sit out overnight in a cool, dark location. OK. Honestly…. We probably used too much herb for a single bottle of wine. 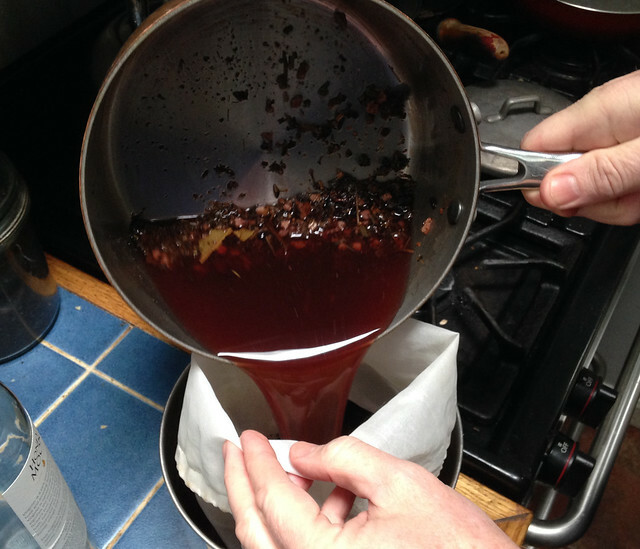 Recipes do call for much smaller quantities, but we generally prefer a more bitter brew. 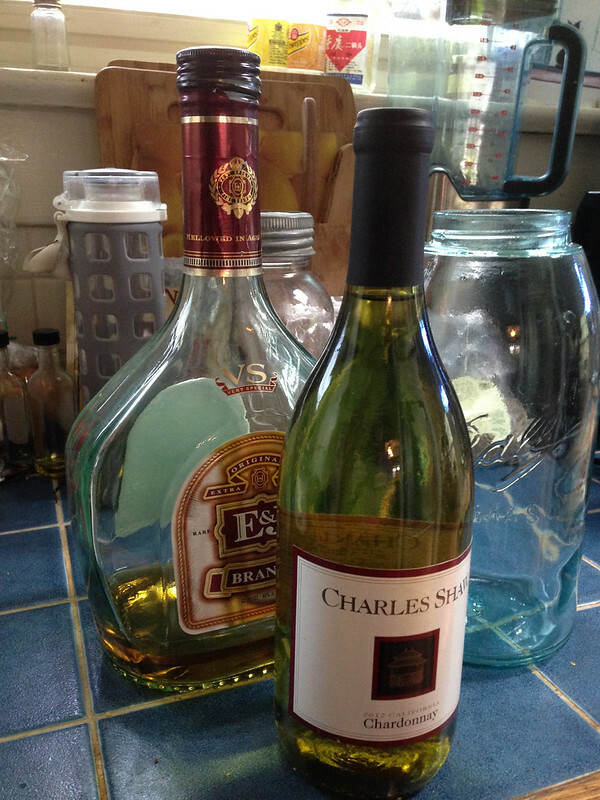 We still added another 1/3 bottle of wine and some inexpensive vodka. Adding a citrus rind twist also greatly mellowed out the flavor. This made it more palatable, but it was still definitely a dry vermouth. Next time, we’ll either double the wine or reduce the herb quantities. We further enjoyed our homemade vermouth by making a “shim” (or a reverse martini), a low-alcohol cocktail to “keep you level.” Shims generally have 1 to 2 parts vermouth with perhaps 1 part of usually flavored (or sweetened) liqueur or spirit, topped with bitters and perhaps soda water. Don’t forget the twist! This is often a critical component to mellow the characteristic bitterness of an herbal apéritif. Fruity: elderberry, lemongrass, Orange peel, lemon peel, Keffir lime leaves (you can get the latter from Duangrats Oriental Market in Falls Church – it’s a staple of Thai cuisine). 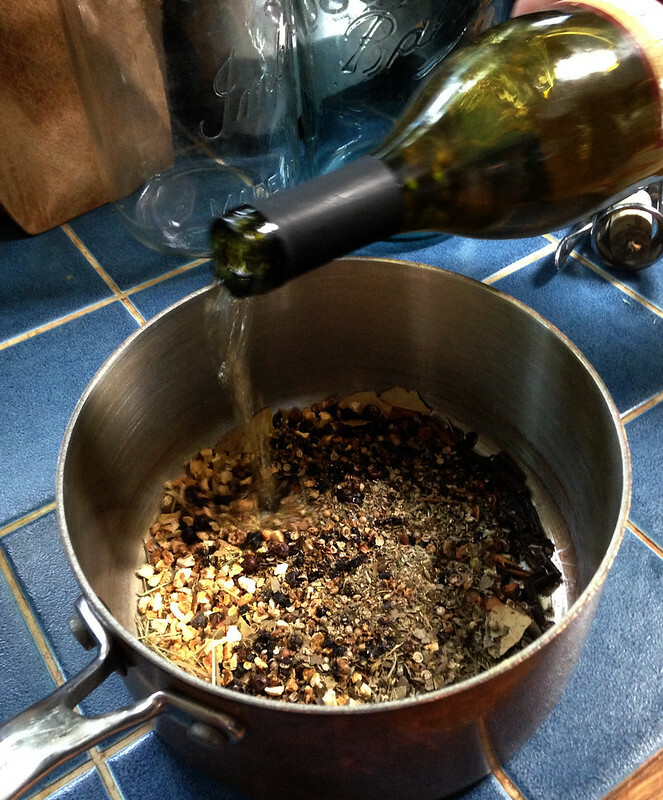 Put herbs in a pot and cover with wine. Bring slowly to a slow boil. Once it’s at a boil on the lowest heat setting, turn off heat. Let it cool on the stove and sit overnight. 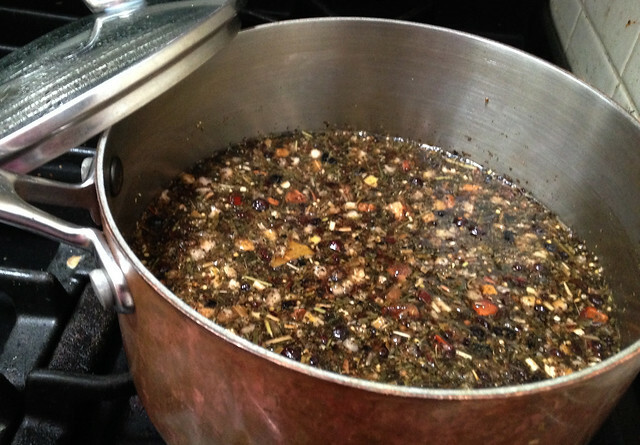 The next day you strain off the herbs and add the spirits. It’s basically ready at that point. 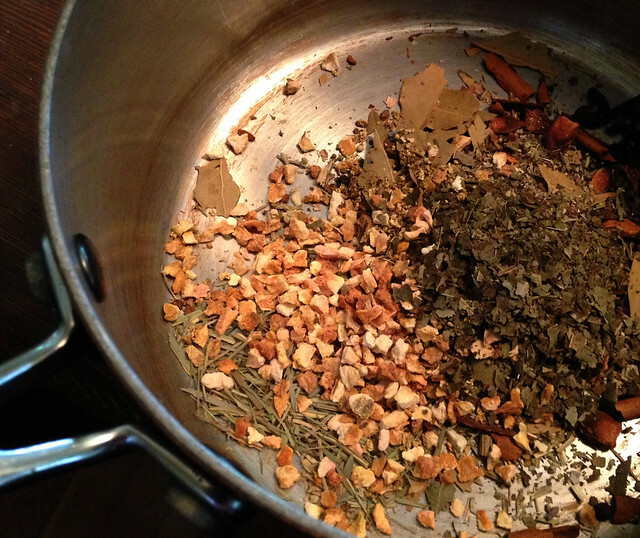 Penn Herbs: Has smaller bulk quantities, 1-ounce, 4-ounces, 1-pound. Frontier Coop: The certified organic equivalent of McCormick, but also sells usually larger bulk amounts, 1-pound, of harder to find herbs. 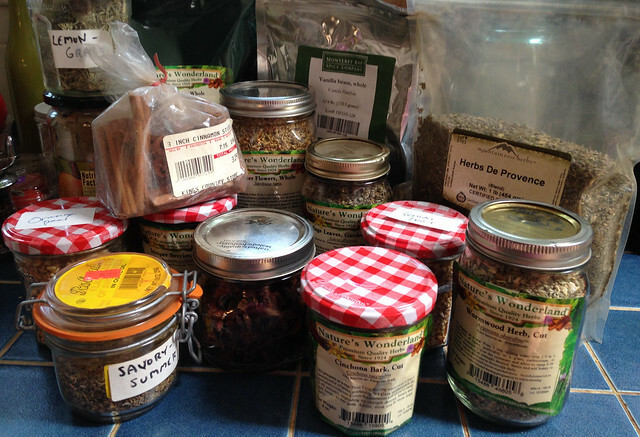 Mountain Rose Herbs: They don’t always have the more obscure herbs.